Manufactured in limited edition as the celebratory plate located on the upper steering yoke indicates, the V7 II Racer confirms the previous model’s equipment and features when the total-black look was introduced on the side panels, mirrors, silencer brackets and footpeg guards in contrast with the bright 22 litre chromium fuel tank. Other premium components include the aft-mounted footpegs machined from solid billets, the lightened steering stem and the steering yoke guard consisting of a double chromed ring, which is so exquisitely crafted that it looks like an ornamental feature. Particularly satisfying, not only from an aesthetic point of view but also in terms of dynamic performance, is the presence of a pair of WMY01 Bitubo shock absorbers with adjustable spring preload, in extension and compression, thanks to a 12 click adjusting knob. This is a bike that was born to be ridden strictly one-up, in black leathers, a skullcap helmet and leather stud palm gloves. Introducing the new generation of one of the best-selling and popular “Eagle brand” models anywhere in the world. 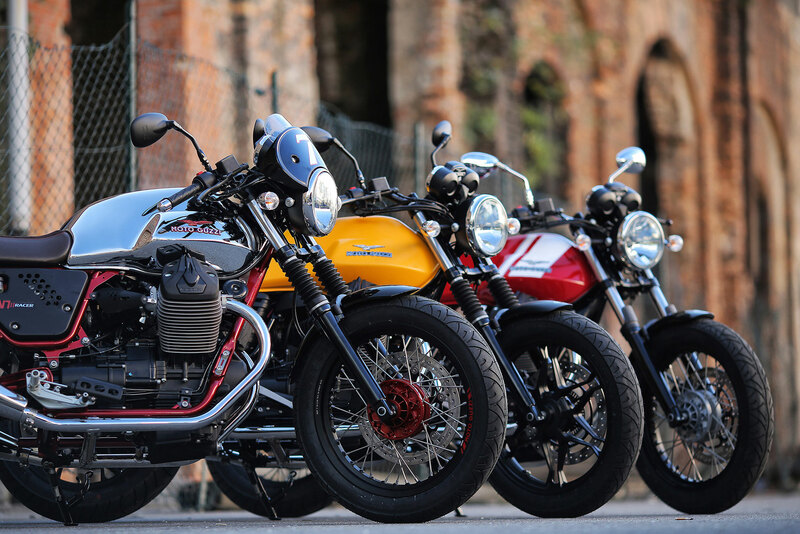 The new Moto Guzzi V7 II was christened thus according to Mandello tradition and it is available in three different versions, each with its own identity: Stone, Racer and Special. Moto Guzzi V7 II literally has an extra gear. In fact, making it’s dÃ©but on the V7 II – and it is just the first on a long list of safety and performance technical advancements – is a new, six speed gearbox with spacing that has allowed the first and last two ratios to be reduced, decreasing the drop in rpm between one gear and the next. Along with the gearbox the clutch was also improved in order to achieve a softer action and a more even release. Moto Guzzi continues to develop solutions to increase active safety features and on the new V7 II the ABS braking system and MGCT (Moto Guzzi Controllo Trazione) system have been introduced. The former is a two-channel system, whereas the latter is a sophisticated electronic system that ensures ideal traction in any conditions, preventing the rear wheel from sliding during acceleration, thereby averting dangerous loss of grip to increase riding safety. The aesthetics have also evolved: on the new V7 II the engine has been tilted 4° toward the front axle and lowered 10 mm. This solution not only significantly improves the aesthetics from a side view, which on previous models seemed to have a “nose-up” look of the 90° V, but it also created more knee room. In fact, the new V7 II, which also has new 25 mm lower footpegs, provides a comfortable position even for above average height riders, while remaining accessible and “user friendly” for riders – men and women – of any size. 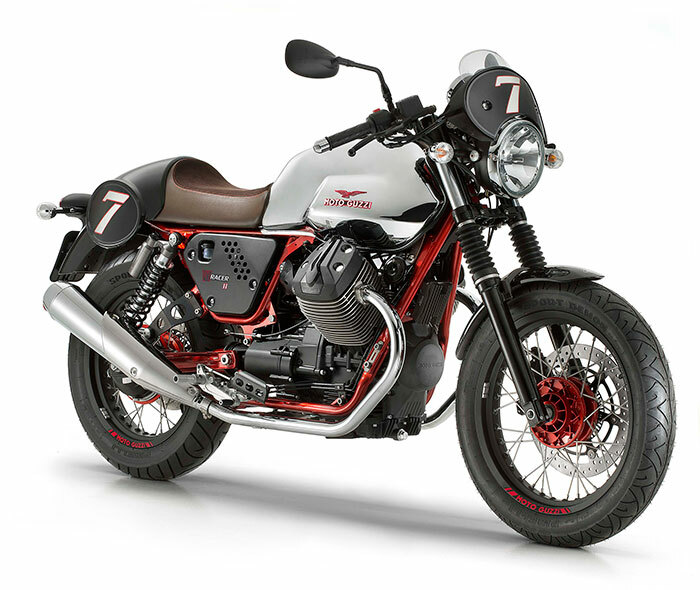 The new Moto Guzzi V7 is available in three versions: V7 II Stone, eclectic and essential, characterised by typical ’70s colour schemes; V7 II Special, the closest to the original spirit of its ancestor, starting from the graphics inspired by the famous 1975 V750 S3; V7 II Racer that embodies the Moto Guzzi sports spirit. With its sporty set up, low handlebars and a chromium fuel tank with a leather fastening strap, V7 II Racer is a bike that was born to be ridden strictly one-up, wearing black leathers and leather stud palm gloves. Improving a Moto Guzzi is never easy. 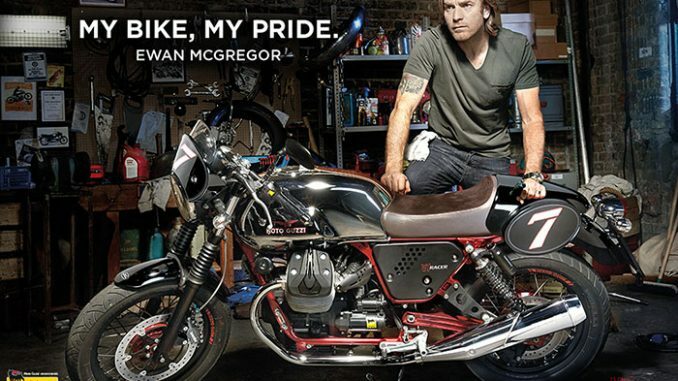 It takes courage, passion and skill to live up to the expectations and reputation of a legendary brand that is beloved the world over for its coveted motorcycles. The best recent example of this magical combination is the California 1400, a final exam passed with flying colours by the market critics. Now Moto Guzzi relaunches, improving on the other pillar in its product range: the V7. On the best selling Moto Guzzi of 2008 every possible useful element to enhance the sensation of quality, even tactile, has been finely fashioned. The most radical change was to the engine and the chassis where every possible path was explored to increase the level of safety, ergonomics and comfort – in short, the pleasure of riding. The result achieved represents enough of an evolution to warrant a new name: V7 II. The addition of the Roman numeral historically identifies the most successful and longest running products to come out of Mandello del Lario, such as the V50, Le Mans, 1000 SP, California and now also the V7 in its well known and popular versions: Stone, Special, Racer. It’s not just an expression; the V7 truly has an extra gear. One look at the gearbox is enough, now completely redesigned in order to house forced lubrication with an oil pump. The new six gear spacing allowed the first and last two ratios to be reduced, decreasing the drop in rpm between one gear and the next. The primary drive ratio has also been changed, going from 16:21 to 18:23. Along with the gearbox the clutch was also improved, with modifications to the lever, the linkage and the cable in order to achieve a softer action and a more even release. Moto Guzzi has always had a keen eye toward safety aspects, even as early as the days of the famous combined “integral” braking system. Today Moto Guzzi continues to develop solutions to increase active safety features for the rider and on the new V7 II the ABS braking system and MGCT (Moto Guzzi Controllo Trazione) system have been introduced. The former is a Continental two-channel unit, whereas the latter is a system passed down from the California 1400, simplified in operation, which adapts to the vehicle speed, springing into action based on the difference in speed between the front and rear wheel. Among other things, the system allows the tyre contact surface with the ground to be recalibrated, thereby compensating for any wear or the use of units that have a profile different than the original standard equipment. Two indicator lights on the instrument cluster signal activation of the ABS and MGTC action. THE FIRST IMPRESSION IS THE ONE THAT COUNTS. Looking at the V7 II for the first time, the trained eye of an enthusiast may sense an initial significant difference: the bike appears to be longer and more front-loaded. This is not an optical illusion: the engine has been tilted 4° toward the front axle and lowered 10 mm compared to the previous model. This has created three more centimetres of knee room which, along with the new 25 mm lower footpegs, provide a comfortable position even for taller than average riders. Besides comfort, the Moto Guzzi V7 II is a whole other bike in terms of riding pleasure. All you have to do is squeeze the clutch and engage the gear to appreciate a soft and quiet action which was unheard of on the previous five speed gearbox. Once you are in the saddle, lowered to 790 mm, you’ll discover how the new saddle-handlebar-footpegs triangulation transmits the pleasant sensation of being in the bike and not on top of it like with the previous version. The new riding position allows you to fully enjoy the changes made to the chassis which, thanks to the new lower and farther forward position of the engine, have made it more communicative and efficient in demanding riding. The rear axle has also been restabilised, increasing suspension negative travel by lowering the cardan final drive output 50 mm. This now allows greater tyre grip during load transfer, both in braking and direction changes. 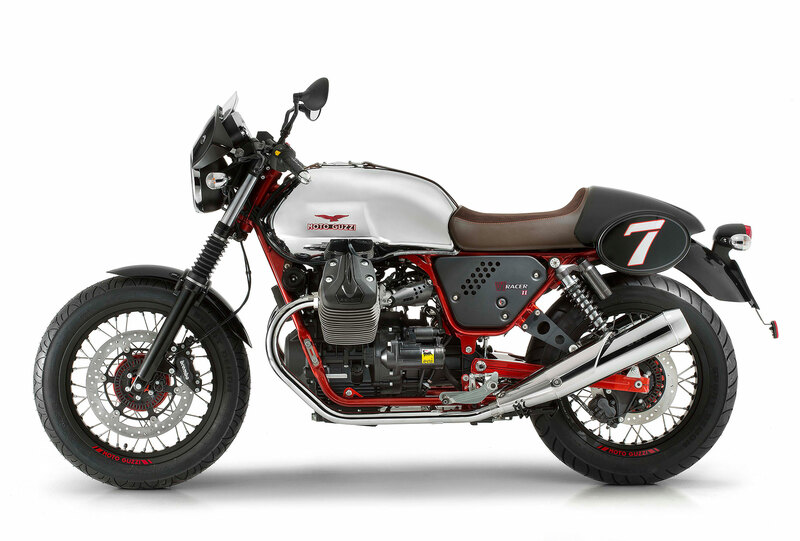 *The new Moto Guzzi V7 II will be available in European markets from November 2014. THE ENGINEERING OF THE MOTO GUZZI V7 II: ANDREA BENEDETTO, PIAGGIO GROUP TWO-WHEEL PRODUCT DEVELOPMENT DIRECTOR. 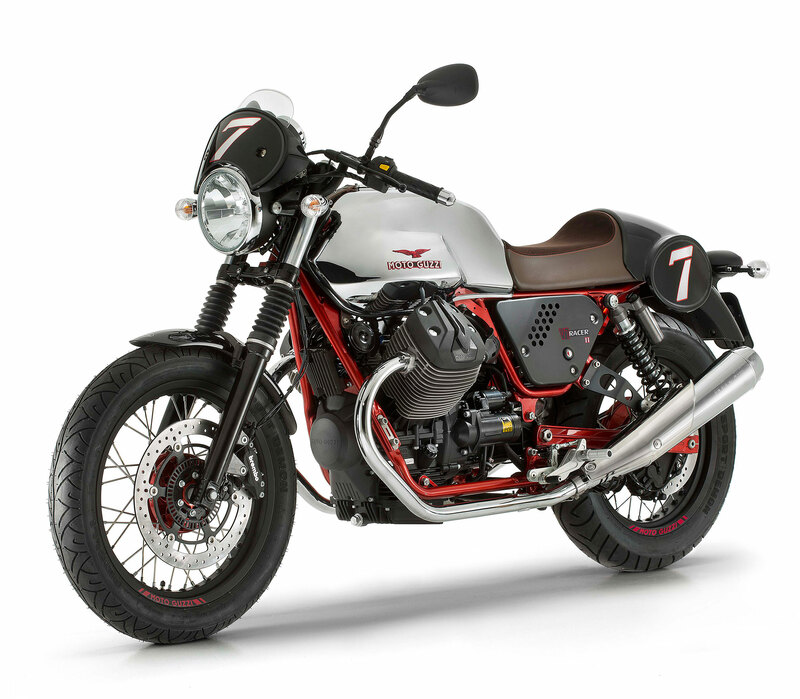 “Just unveiled at the recent Intermot 2014 show in Cologne and coinciding with the Milan EICMA show, the new Moto Guzzi V7 II arrives on the market. As indicated by the “II” which identifies it – in complete respect of Moto Guzzi tradition – this bike represents a true generational evolution with respect to its predecessor. Although in terms of aesthetics it maintains its unmistakeable and successful style, this brand new V7 generation has a range of new features that change it profoundly in terms of technical content, so much that it can be called the second generation of a product which from the time it was introduced has found favour with those seeing a motorcycle that provides riding pleasure, user-friendliness and the pride of owning an object that embodies the style and elegance values of Italian bikes. On the new Moto Guzzi V7 II the geometry of the mechanics was entirely modified: the frame now holds the classic 750cc 90° V-twin engine, placing it 10 millimetres lower and rotating it 4° forward. The result – besides improving the aesthetics of the bike’s side view – is a lower centre of gravity, all to the advantage of riding pleasure and more legroom for the rider. Comfort increases thanks in part to the new footpegs which are mounted 2.5 cm lower than those on the previous model. This means that the bike can comfortably seat taller than average riders, whilst remaining accessible and easy to ride for any height man or woman. The gearbox is completely new, now with six speeds. This is an extremely sturdy and reliable unit that has allowed spacing to be varied, bringing the first and last two ratios closer, thereby reducing the drop in rpm between one gear and the next. It is a gearbox that maximises riding comfort thanks in part to a softer clutch that engages more easily and more precisely. Moto Guzzi has always been one of the most attentive brands to safety, from the time that the first manufacturers were fitting double discs on their bikes or implementing integral braking systems as standard equipment. 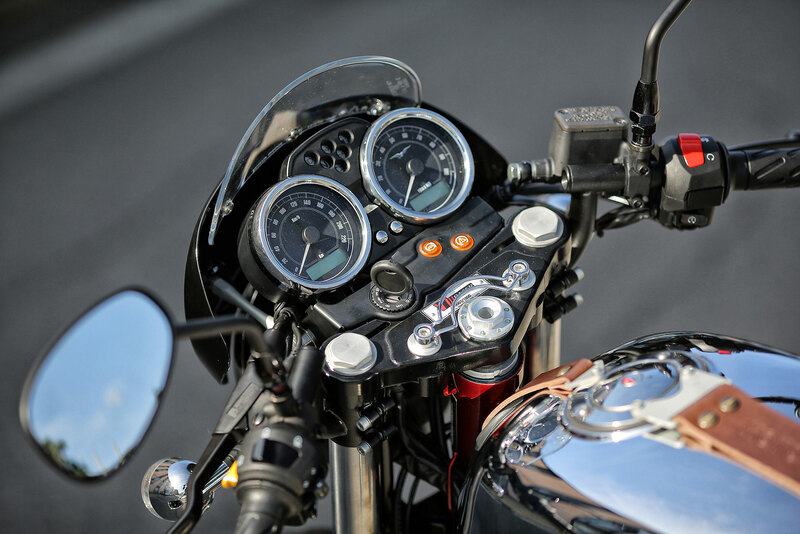 Now, on the V7 II, the ABS and MGCT (Moto Guzzi Controllo Trazione) systems are introduced. The braking system becomes a benchmark in its category thanks to the two-channel ABS system, new brake master cylinders and sintered pads. The MGCT system, which draws from Moto Guzzi’s experience with the California 1400, reading the differential slippage between the two wheels, acts on the injection system, cutting power and proving to be an essential aid in poor grip situations. So the V7 II is more and more of a transversal bike, suited for less experienced riders thanks to the new safety systems, as well as more seasoned bikers who are looking for riding pleasure in timeless style. A THOUSAND DETAILS TO MAKE THE V7 II UNIQUE. Not only customisation kits, but a vast range of accessories that allow the customer to personalise his or her V7 and make it more compatible with their own aesthetic tastes and needs. SEMI-HANDLEBAR KIT: available for Stone and Special, this kit lowers the riding position, making it just like the V7 Racer. It includes the accelerator control cables and the dedicated front brake lines. TWO-SEATER KIT: made for the Racer, this kit includes everything needed to make the bike a two-seater. SINGLE-SEAT SADDLE: single-seat saddle to set up the bike in racer mode. RACING SLIP-ON EXHAUST KIT: made in collaboration with Arrow, the kit is comprised of a pair of polished steel silencers, not approved for use on public streets. The conical shape is reminiscent of the competition silencers that V7 bikes in the ’70s era factory derivative races mounted. They install on the factory manifold without making any modifications, using the original supporting mountings and brackets. No specific engine ECU mapping is required and they guarantee a significant reduction in weight, as well as improved performance in the mid-range and at maximum power, providing more responsive acceleration and a much sportier sound. SINGLE-SEAT EXHAUST MOUNTING KIT: these are two mountings made from high quality anodized aluminium which replace the factory supports, thereby allowing the passenger footpegs to be eliminated, making the bike a single-seater (Stone and Special). BITUBO SHOCK ABSORBERS KIT: this pair of Bitubo shock absorbers with separate gas bottle has been designed specifically for the V7 and its particular needs. They are have adjustable hydraulic spring preload in rebound and compression. Thanks to the possibility of personalised calibration they are able to guarantee greater comfort and better rideability, as well as standing out with a truly unique look. ALUMINIUM SIDE FAIRINGS KIT: the brushed and anodized aluminium side fairings contribute to making the V7 II profile even more tapered. In this case, the style is once again reminiscent of the hand crafted creations that were used in ’70s era racing. TOP FAIRING KIT: this kit includes a moulded, unpainted plastic top fairing and aluminium brackets as well as the mounting hardware. FUEL TANK COVER KIT: these are two soft rubber covers that are applied on the sides of the fuel tank where the rider’s knees rest in order to increase riding comfort. MOTORCYCLE COVER: this is made in black scratch resistant fabric and is enhanced by the Moto Guzzi logo on both sides. TOURING WINDSHIELD KIT: this is designed to provide greater aerodynamic protection without compromising the attractive aesthetics of the V7. 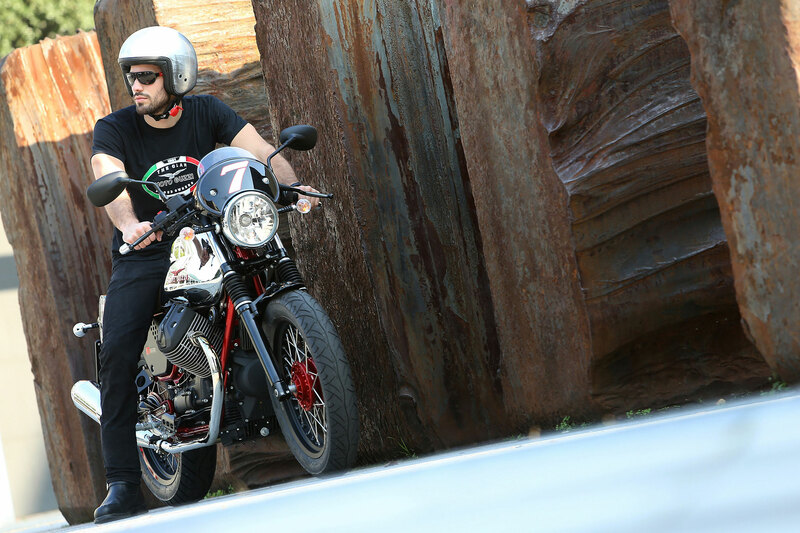 It is type-approved to the strictest standards (DOT and TUV) and road tested in all weather conditions by Moto Guzzi test riders. CENTRE STAND: this is another component designed and engineered to comply with the strictest safety and endurance standards. It is made in cataphoresis-treated and powder-coated steel to make it impervious to weather conditions. INJECTOR COVERS KIT: these are made in aluminium and provide protection of the injectors area from accidental contact with the rider’s knees. SIDE PANNIERS KIT: this is comprised of two 20 litre capacity rigid nylon panniers. The bags are covered in genuine waterproof leather and have chromium steel buckles. The kit includes the high resistance steel mounting frames and a pair of removable internal bags. LUGGAGE RACK KIT: this valuable item serves two important purposes: on one hand it is a luggage rack and on the other it provides a solid hold thanks to the two built-in handles. This accessory is made of high resistant steel, TIG welded and subsequently chromium plated. It mounts in place of the original passenger grab handles. SET-BACK FOOTPEG KIT: the set-back (or aft-mounted) footpegs are derived from the standard equipment pegs on the Racer version and they provide a more sporty riding position. They are made of anodized aluminium and the kit includes all the mounting hardware (for V7 Stone and Special). RACING SLIP-ON EXHAUST KIT FOOTPEG BRACKET: these are supports with built-in footpegs which allow the V7 racing slip-on exhaust kit to be installed without giving up the bike’s original two-up configuration (for Stone and Special). SEMI-RIGID PANNIERS KIT COMPLETE WITH MOUNTING BRACKETS: thanks to a 42 litre cargo capacity, this pair of semi-rigid panniers is ideal for those who do not want to give up transporting items on their V7. Made in technical Skai, they easily hook onto the brackets that are included in the kit. The reflective profiles also increase nocturnal visibility. The new personalisation accessories round out the innovations presented at EICMA which will be available in 2015: a line of helmets which are completely new in terms of design and technical and aesthetic characteristics, all of which prominently display the Eagle Brand logo that embodies motorcycling passion, Italian style and a rich heritage of sport and industrial success. Alongside the helmets there will also be a new line of vintage leather and fabric jackets, as well as technical gloves in line with Moto Guzzi style that allow you to exploit and enhance your riding experience and sense of belonging to the world of Mandello bikes. 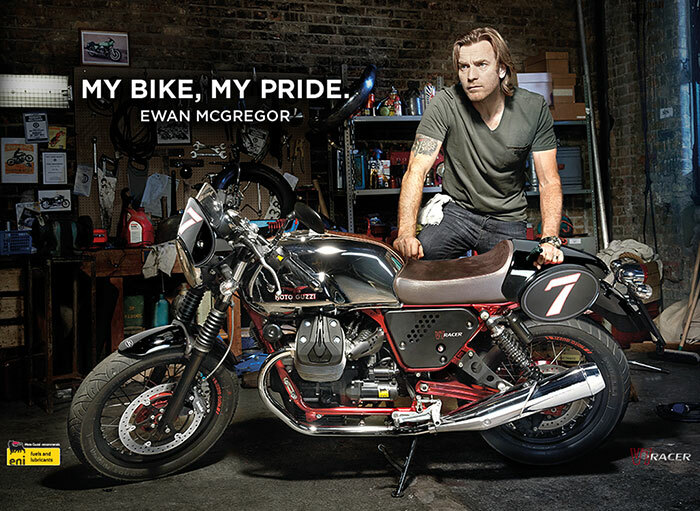 Confirmation that the Moto Guzzi V7 constitutes an extraordinary platform for customisation also stems from the enthusiasm with which the greatest “unique bike” artists in the world have always taken on transformations of Guzzi models into special magazine cover works of art. At the Milan EICMA 2014 show four of the most important European preparers and customizers have been invited to present their tributes to Moto Guzzi by creating as many unique versions. This important initiative that Moto Guzzi has organised is just the first step in a strategic outline aimed at a progressive and continuous expansion of available accessories and the possibilities for personalisation, all associated with a painstaking eye for detail, quality, the great Moto Guzzi heritage and typical “Made in Italy” taste. THE ORIGINS OF THE LEGENDARY V7. THE EVOLUTION ACCORDING TO LINO TONTI. FROM THE V7 TO THE 850 GENERATION.